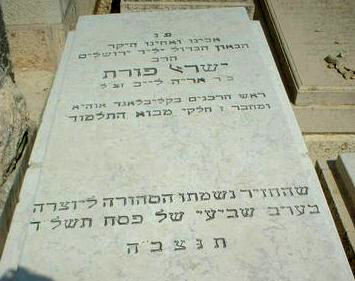 Rabbi Israel Porath and his wife Peshe Miriam Ticktin are buried side by side in Har HaMenuchot Cemetery in Jerusalem. As you walk up the path there are the graves of his brother Noach, then father Arye-Lieb, then Harav Yisrael and finally HaRabanit Miriam. Har HaMenuchot (Hebrew הר המנוחות‎) means "Mount of Rest". 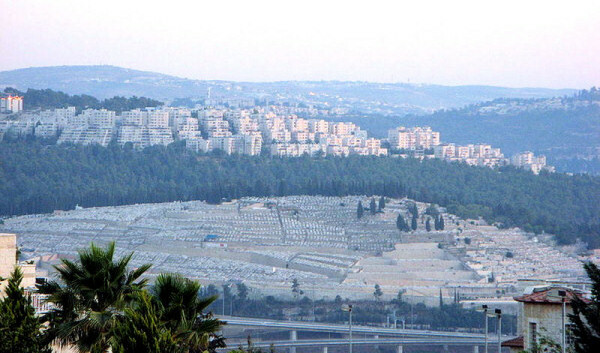 It is the largest cemetery in Israel. Opened in 1951, it has expanded often and, as of 2008, held more than 150,000 graves. 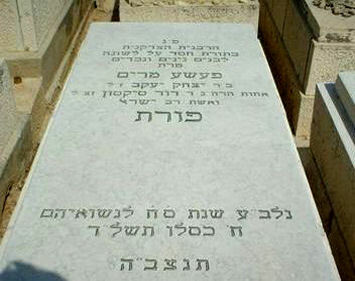 As in other Jewish cemeteries in Jerusalem, the plots on Har HaMenuchot consist of an underground grave topped by a rectangular platform of poured concrete, faced with stone tiles, that rises 2 feet (0.61 m) or more above-ground. The name, date and praises of the deceased are inscribed on the top panel and occasionally on the sides.